As a programmer I often end up trying to explain non-technical concepts for non-technical people using things that I've picked up as a programmer. Often it doesn't pay off. "Don't Repeat Yourself" or "Tell - don't ask" is not always easy to explain or translate. Even if they hold truths and wisdom. Today I tried to explain Technical Debt to a director of a hospital. That didn't really work - my mistake. However the Technical Debt metaphor is in turn based on something that most grown-up people understands: financial debt. As a programmer I often end up trying to explain non-technical concepts for non-technical people using things that I've picked up as a programmer. Often it doesn't pay off. "Don't Repeat Yourself" or "Tell - don't ask" is not always easy to explain or translate. Even if they hold truths and wisdom. 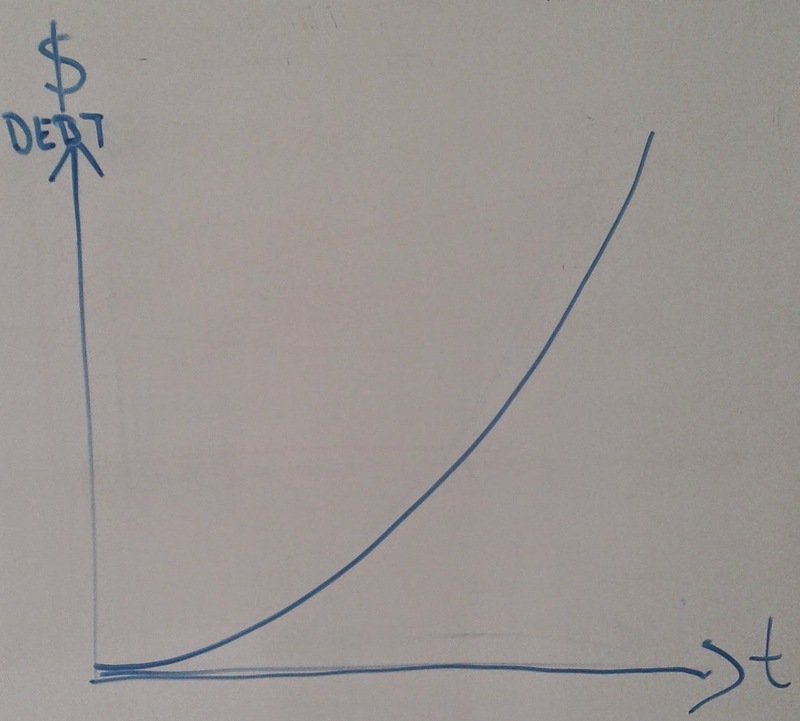 Today I tried to explain Technical Debt to a director of a hospital. That didn't really work - my mistake. However the Technical Debt metaphor is in turn based on something that most grown-up people understands: financial debt. You know about debt, right? I asked her. The longer we wait to do down-payments the more the debt increase, due to the interest rate it incurs. I removed the $-sign and wrote "Communication" in it's place. Because it's the same thing with communication and interaction. The longer we wait to communicate with someone, the more confusion, misunderstandings, interpretations and beliefs we make. It's like we're trying to 'cover up' the missed communication and fill out the blanks with our own mind. The only thing that can pay off the communication debt is to meet again. Then we can clear out any misunderstandings and sync up, hopefully making sure that we're talking about the same thing. Communication debt start ticking the second we part. You meet someone else and get new information. I start to think for myself. I talk to my group, you talk to yours. Things happen. We form our separate opinion. Now imagine that this went on for 1 day, 10 days, 1 month, 6 months... and that's when we end up in strange situations and "she doesn't want to talk with me" or "I simply don't understand them". We can do something about this. And it's simple too. We control the dial to this problem; namely - we decide how often we meet. 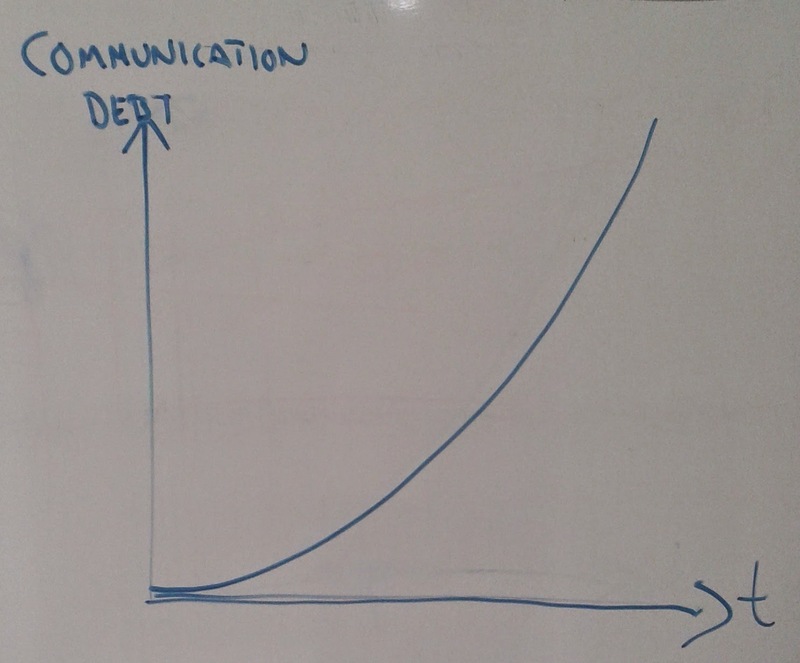 If we meet only once a year - communication debt has built up over this time. Meet every week - almost no communication debt. One of my good friends worked for 6 months in Brazil. I asked him how that was and the first thing he said was: they never start to work in the mornings. As it turns out it's very rude not to greet everyone in the morning. When you step into the office you walk around and greet everyone. Basta! It's since ancient times. And since not everyone arrives at the same time... well there's a lot of walking around greeting each other. This can be applied to management to, called by some management by wandering around. Dan North describe the habits of one team lead to walk around taking up orders for coffee and tea in the afternoon. Hi, what do you want to drink? Ah black coffee today. Ok. How's work? Ok - awesome. Anything else? See what he did there? Just very friendly question and then open for communication. I've tried this at my the hospital where I work now. I make it my thing to just walk around to each department (it's 10 so it takes about 12 minutes) and asking them how they are. It's about as far as my Indonesian stretches now. But from these simple question you can tell a lot. Facial expression just by seeing me coming (Oh no, not him again... not today), the tone of the their voice, are they Ok or do the shout "AWESOME" (like the ladies in the laundry room always does...) things like that. Also - sometimes they ask me a question. Or I can explain something that they didn't understand. Walking around, keeping the conversation going is basically just keeping the communication debt to a minimum. That, and to be and spread happiness.